A workhouse operated at Lenham from around 1730 (Hitchcock, 1985). A Parliamentary report of 1777 recorded parish workhouses in operation at Hollingbourne (with accommodation for up to 40 inmates), Boxley (36), Lenham (40) and Sutton Valence (20). 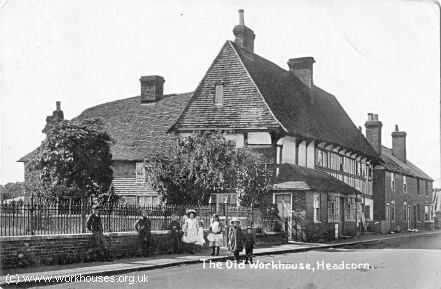 A building known as the Cloth Hall, on North Street, Headcorn, is said to have served as the parish workhouse. 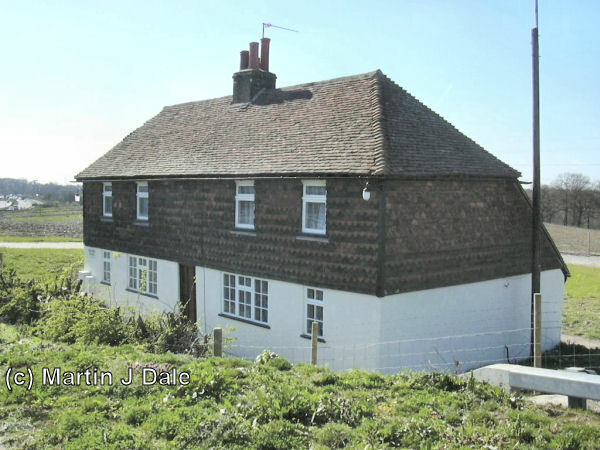 A cottage on Sittingbourne Road, Detling, was the parish's workhouse in the early 1800s. It is now a private residence known as Workhouse Cottage. County of Kent: Bicknor, Boughton Malherbe, Boxley, Bredhurst, Broomfield, Chart next Sutton Valence [Chart Sutton], Debtling [Detling], Frinsted, Harrietsham, Headcorn, Hollingbourne, Hucking, Langley, Leeds, Lenham, Otterden, Stockbury, East Sutton, Sutton Valence, Thurnham, Ulcombe, Wichling, Wormshill. The population falling within the Union at the 1831 census had been 13,365 with parishes ranging in size from from Bicknor (population 44) to Lenham (2,197). The average annual poor-rate expenditure for the period 1833-5 had been £18,400 or £1.7s.6d. per head of the population. Hollingbourne workhouse from the west, c.1920. 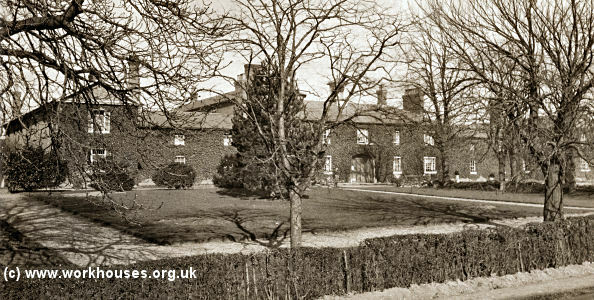 The workhouse closed in around 1921 and the buildings demolished with the exception of the 1895 mortuary which still stands in the grounds of the property, now known as White Heath. 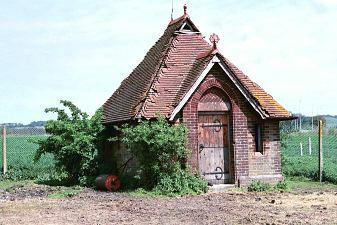 Hollingbourne workhouse mortuary from the south-west, 2001. Kent History and Library Centre, James Whatman Way, Maidstone, Kent ME14 1LQ Holdings include: Guardians' minutes (1848-1930); Births (1866-1920); Deaths (1866-1921); Creed registers (1914-21); etc. Canterbury Cathedral Archives, The Precincts, Canterbury, Kent CT1 2EH. Baptisms (1837-76). Thanks to Martin Dale for the picture of the former Detling workhouse where he grew up.